President Bush, shadowed in Europe by a pressing concern back in Washington, said Wednesday he will not select a Supreme Court nominee based on his or her views on abortion or other hot-button political issues. He urged senators to act "in a dignified way" in what is expected to be a contentious battle over confirming his first nominee to the nation's highest court. Also Wednesday, the White House announced that Mr. Bush had named former Tennessee Sen. Fred Thompson to help shepherd his yet-to-be named Supreme Court nominee through the Senate. Thompson, 62, a Republican and actor on the NBC television series "Law & Order," agreed to accept the post in a telephone conversation with the president on Monday, spokesman Scott McClellan said. He said Thompson would serve as an informal adviser to shepherd the nomination through the Senate. Mr. Bush was visiting Denmark to thank the Danes for sending troops to Iraq and Afghanistan. He also strongly defended his decisions on Iraq, climate change, imprisoned terrorism suspects and aid to Africa — all of which have made him unpopular in Europe. "I understand that people aren't going to agree with decisions I make," Mr. Bush said as he stood alongside Danish Prime Minister Anders Fogh Rasmussen outside a white mansion that serves as his official summer residence. "I truly believe we're laying the foundation for peace." Mr. Bush said that as he reviews candidates to replace Justice Sandra Day O'Connor, "I'll try to assess their character, their interests." Mr. Bush said he would have no "litmus test" that disqualifies candidates because of their opinions on abortion and gay marriage. "I'll pick people who, one, can do the job, and people who are honest, people who are bright and people who will strictly interpret the Constitution and not use the bench to legislate from," he said. He has said that he will spend a few weeks narrowing a list of candidates and then interviewing some, and his goal is to see a new justice in place by the time the court begins its new term in October. "I will take my time," Mr. Bush said. "I will be thorough in my investigation." Even as he studies the legal backgrounds of prospective nominees, Mr. Bush acknowledged, "I'm not a lawyer – thankfully." But he is worried about special interest groups on the far right and left trying to influence who gets nominated and confirmed, reports CBS News White House Correspondent Mark Knoller. Mr. Bush bristled at criticism of Attorney General Alberto Gonzales, a longtime friend who is often mentioned as a potential nominee for the high court. Conservatives said they aren't convinced Gonzales' beliefs on affirmative action and abortion are far enough to the right for their liking. 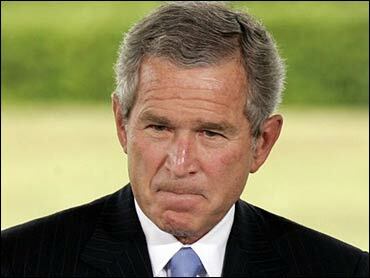 "I don't like it when a friend gets criticized," Mr. Bush said. "I'm loyal to my friends. Mr. Bush spent his 59th birthday here to thank Denmark for the several hundred troops the Scandinavian nation has contributed to the U.S.-led fighting in Iraq and Afghanistan. Outside Fredensborg Palace, where Mr. Bush had lunch with Queen Margrethe II and her husband, a group of people held small U.S. and Danish flags — and a large banner proclaiming, "Happy Birthday George." A smaller group held several protest banners urging U.S. and Danish withdrawal from Iraq and "Peace." Fogh Rasmussen said the Danes were glad to help with both missions. "We share the belief that freedom is universal and we share the belief that in the struggle between democracy and dictatorship you cannot stay neutral," the prime minister said. After lunch with Queen Margrethe and about 50 other guests, Mr. Bush headed for a summit of rich nations in Scotland where discussion about the world's changing climate and aid to Africa were at the top of the agenda. Mr. Bush said he is proud of his administration's tripling of U.S. aid to Africa, and his decision to double aid again by 2010. But his pledge still falls short of the commitment sought by British Prime Minister Tony Blair, the summit host. On climate change, Mr. Bush said warming temperatures are partly caused by manmade emissions. But he renewed his objection to the international Kyoto Protocol that mandates certain reductions. "I think there's a better way forward," he said. "I would call it the post-Kyoto era, where we can work together to share technologies, to control greenhouse gases as best as possible."